When will the competitions backup/restore be as incredibly smooth as Apples? Discussion in 'Alternatives to iOS and iOS Devices' started by spinedoc77, Sep 15, 2013. I just sold my iphone5 in anticipation of getting a 5S (or maybe a Note 3, haven't decided yet). Anyway I am using a iphone 4 I had laying around in the meantime and it is always amazing to me just how seamless restoring a backup is, even to a different phone and a different model with different memory. I think this is one of the areas that Google and Microsoft really need to beef up. Google has nothing except what is under your google account, calendar, contacts, etc. I know there are 3rd party apps like Titanium, which I have used and are decent, but Google needs something that is on every phone from the factory like Titanium, maybe they should buy them out. Microsoft has about the same thing thru outlook/Hotmail, they also need something more. Working for the GeekSquad, it can't happen soon enough. Can't tell you how pissed off customers are when they've got 30+ apps, and I can't give them a simple yes or no as to whether we can back their information up. My problem with Android is that it's giving consumers far too many options, with no feature to streamline anything. It's great that there are so many options, but the average consumer simply can't make sense of all of them and think that I'm the bad guy because they can't figure out how to use their phone. I've found Windows phone to be better than android as far as backing up and restoring, but it still falls short of the way the iPhone does it. I absolutely hate resetting my phones for this reason. How does the GS4 with Kies fare as a backup and restore solution on the same model? I don't have high hopes for cross device backup and restore with android. Gah, I despise Kies. If I had to rely on that garbage for backing up my device I'd shoot myself. This is built into stock/AOSP Android. Admittedly, it did not work well when using the stock TouchWiz ROM on a GS3. The transition from Nexus 4 to Moto X to HTC One was seamless, though. My apps and settings were automatically downloaded when I signed into my Gmail account. What doesn't Google backup/restore that Apple does? Basically Apple takes an 'image' of your iPad/iPhone at its current state. Pretty much everything is the same as if you never cleared your phone/got a new one. Android on the other hand.....Meh. That's all I am saying. This is definitely one area where after so many years, nobody has seemed to catch Apple. I always used Nandroid backups (Original Droid and Thunderbolt) when rooted..that backed up every single part of the phone and seems about the same to me. Of course, the fact that root was needed means it's not the same level as Apple's backup/restore system, but that doesn't mean it's not possible. I agree, the built in backup and restore function works great for everything aside from reinstalling Apps. I ran into a lot of issues restoring from backups on my iPhones and iPads, so I eventually just did fresh installs and avoided the backup. Googles implementation works better for me. Besides not restoring Homescreen settings such as wallpaper and app folders, there's really nothing Apple restores that Google doesn't. I never done to many restores, since I was jailbroken most of the time. And restoring a jailbroken iPhone would usually screw something up. So I would do a fresh install or upgrade instead. ... when the competition controls the entire stack from hardware through software to cloud infrastructure. I've done Android restores that gave me back my wallpaper and app folders. Happened on my Nexus 7. Google doesn't restore app data so it's basically like a fresh install every time. And yes, wallpaper and home screen arrangements/settings aren't restored--may be trivial to some but it takes time to set up, especially if you've customized a launcher. And yes, I'm aware that launcher settings can be backed up but it's a completely manual process and you have to move the backup file so that it isn't lost in the event of a full restore. Also, I cannot recall as I avoid full resets as much as possible but I don't believe wifi networks/passwords are restored. 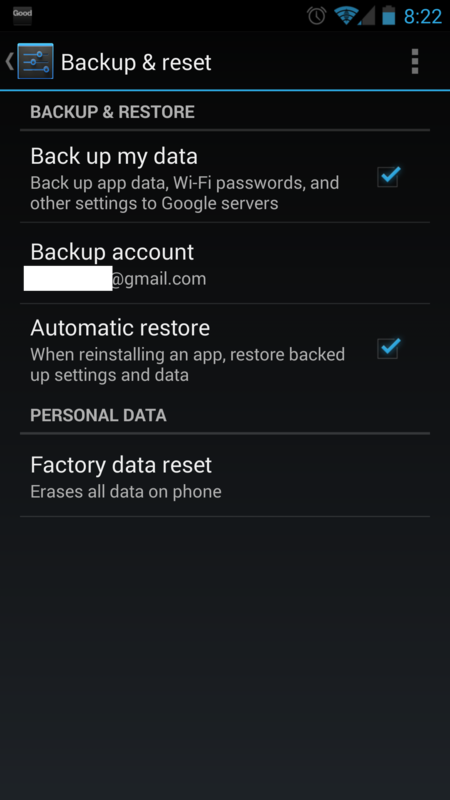 Google does a whole helluva right in Android but their backup solution isn't one of them. Really? Never happened for me in the past, always had to set up everything again. Maybe this element has changed, for the positive. UPDATE: Just thought about it and maybe it's because I always use Nova and that isn't restored automatically. I used Helium when I had my Androids. Worked fine. On both android phones I've owned I haven't had much luck getting stuff restored after a reset unless I used titanium backup. If you configure Android, it'll offer much more flexibility. And you can back up whole images there too. Apple's back up is great, but it is limited. It's used only when you want to do a full restore. But what if you accidentally delete a data from some app and want to restore only that data, nothing else. If you do a restore with Apple, it'll restore and overwrite everything. In Android there are many backup applications that allow you to pick and choose exactly what you want restored. Google doesn't restore app data so it's basically like a fresh install every time. Google DOES restore app data. And yes, wifi and passwords too. Well, just received a Nexus 7 LTE and went through the usual steps to set it up, requested it be restored from previous backup and, as I've experienced in the past it basically did a partial restore. It downloaded the apps that I had preciously installed on the WiFi Nexus 7 I used for about a week but that's it. No app data, no wallpaper, No WiFi networks/passwords. And before anyone speculates, yes I have my Google account set up to sync everything and the 'Back up my data' was checked (it's always checked on all of my devices). So, back to setting everything up again. Your wallpaper and wifi passwords should have been synced no doubt. As for your app data, yes Google does sync app data ...... but the developer also has to code it in the app to utilize this feature. Reason you don't see a lot of your app data restored is because a lot of devs refuse to take advantage of this feature (and rightfully so when dealing with so many different software/hardware configurations) . Your wallpaper and wifi passwords should have been synced no doubt. As for your app data, yes Google does sync app data ...... but the developer also has to code it in the app to utilize this feature. Reason you don't see a lot of your app data restored is because a lot of devs refuse to take advantage of this feature (and rightfully so when dealing with so many different software/hardware configurations). Wasn't aware of this part, thanks. I can certainly understand it but still is a PITA. Something went wrong cause it always works fine for me. At the least your wifi data should have been restored. I use nandroid backups for same device restores, full image. I always start fresh on a new device so I don't really care about device to new different device restore.